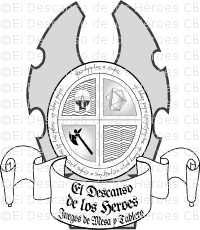 For the Shop “El descanso de los Héroes” (Rest for Heroes) we created a very special Logo. I want to explain here too the Logo Design process that I am used to follow. This logo was based on the original work created by Fernando Tasende. A friend of the owners. This was a original piece made by hand, for the purpose of the Shop Logo. First I scanned the Original Art. Then I worked on the digitisation of the design as it was. I remade it into vectorial using Inkscape software. Based on the first vectorial version, I worked with the co-owners. I made some versions. Until we got the final design that was chosen. I work only with Greyscale till we have a final version, so we do not get distracted with colors. It is important to center in the Logo elements and balance. At last, we made some colour tests, to get a design that matched with the business theme. The Shop was medieval themed, so we looked for this kind of feeling in the colours. And the result was amazing, it was used for everything. From the shop printed signs to key chains. It looked perfect in any size, because it was made in vectorial. Everytime I make a Logo Design, we make some diferent versions to test wich one is better. Here you can take a look at one of the alternate versions for this Logo Design, that was quite a diferent line. ¡Apúntate a mi lista VIP ya! Recibirás un montón de información interesante como esta. Y además, recibe de inmediato mi Guía con todo lo que debes preparar para crear o renovar tu web de servicios. ¡Gracias por suscribirte! Tus datos se han enviado correctamente. Ahora sólo tienes que confirmar tu suscripción desde el e-mail que habrás recibido.